LIVERPOOL, England — Wayne Rooney converted a 77th-minute penalty as Everton snatched a point in a 1-1 draw at Liverpool in the Merseyside derby in the Premier League on Sunday. Liverpool took the lead through Mohamed Salah's league-high 13th goal of the campaign and dominated the game until Dominic Calvert-Lewin fell to the ground after being pushed in the back by Dejan Lovren. Rooney stepped up to send the penalty down the middle for his first goal in a Merseyside derby, in his second spell at Everton. It maintained Sam Allardyce's unbeaten start as Everton manager after three games — seven months after earning a win at Anfield when in charge of Crystal Palace, Liverpool's last home loss in any competition. Everton still hasn't won at the home of its fiercest rival since 1999 but will be more than happy to take a point from a match in which it was forced to defend for large periods. Juergen Klopp saw his team stay fourth and knows his selection will come under scrutiny. The Liverpool manager took the surprise step of breaking up his "Fab Four" attack by naming Philippe Coutinho and Roberto Firmino as substitutes, instead playing Dominic Solanke as striker and bringing Alex Oxlade-Chamberlain into midfield. It was part of six changes by Liverpool from the exhilarating 7-0 win over Spartak Moscow in the Champions League in midweek, but that didn't initially disrupt the team's flow going forward. Everton was on the back foot virtually from the first whistle, with the pace and trickery of Salah and Sadio Mane, in particular, causing the visitors problems. Salah's goal was a mixture of strength and footwork. Receiving a pass from right back Joe Gomez, the Egypt winger shrugged off Cuca Martina, twisted inside Idrissa Gueye, and curled a left-footed shot around Ashley Williams and into the top corner. Mane squandered a two-on-one opportunity, dragging a shot disappointingly wide late in the first half, and Allardyce changed things by removing one of his two strikers — Oumar Niasse — at halftime. 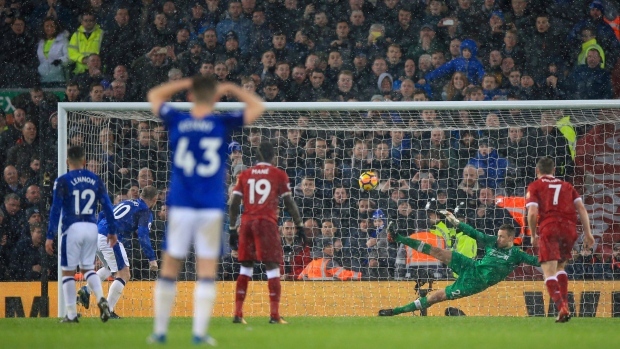 Liverpool still dominated, though Everton goalkeeper Jordan Pickford wasn't seriously tested before Rooney's equalizer against the run of play, following a penalty decision that will be debated long and hard around the city. Lovren did give Calvert-Lewin a slight nudge but maybe not enough to make the striker tumble over as he did. Lovren couldn't believe it when the spot kick was given and Rooney converted it down the middle.